During a recent trip to the Kurdistan Region of Iraq, Austrian Foreign Minister Kurz pledged another 1.25 million Euros in humanitarian aid and announced his intention to increase bilateral ties between Austria and Kurdistan. Foreign Minister Kurz travelled to Erbil on 2 February 2015 with an accompanying delegation including Elmar Brok, Chair of the European Parliament’s Committee on Foreign Affairs, the Austrian Ambassador for Iraq, senior officials from the Austrian Foreign Ministry, the Secretary General of the Austrian Red Cross, the Iraqi Ambassador to Austria, the Representative of the Kurdistan Regional Government (KRG) to Austria and a number of Austrian journalists. At a dinner reception hosted by the Region’s Prime Minister, Nechirvan Barzani, Kurz congratulated the people and government of the Kurdistan Region on the latest victories achieved by the Peshmerga forces. Furthermore, he thanked them for their commitment to provide security and shelter to the more than 1.5 million refugees including many from the Christian, Yezidi and other minorities. Moreover, Kurz stressed Austria’s determination to continue providing humanitarian assistance to refugees and displaced persons. PM Barzani, in return, expressed his gratitude for the humanitarian assistance that Austria has already provided for the Kurdistan Region. Minister Kurz used his visit to announce the decision of the Austrian government to allocate another 1.25 million for those who have taken refuge in the Kurdistan Region. 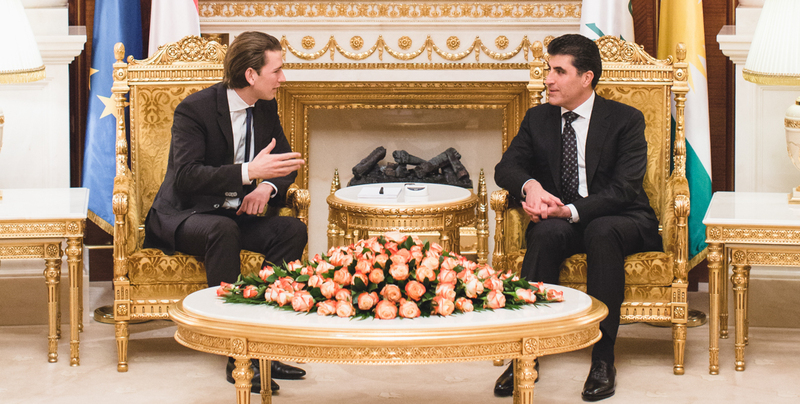 In view of deepening the relations with the Kurdistan Region, Kurz also reaffirmed his government’s plan to appoint an Honorary Consul to the Region, and encouraged the organization of bilateral economic forums and exchange of visits between the respective chambers of commerce. Kurdish officials welcomed these steps, and additionally expressed their interest in receiving advice and assistance from Austria in regard to further strengthening democracy and the rule of law. Kurz was also received by KRG Foreign Minister Falah Mustafa, who briefed him on the security and humanitarian challenges the Kurdistan Region is currently facing, and expressed the Region’s hope to further build on their strong bilateral ties. In particular, the two ministers stressed the need for increased police cooperation to tackle the inflow of European IS fighters into Iraq and Syria as well as their return to Europe. MEP Elmar Brok, who accompanied Minister Kurz, stated in a press conference that more military and humanitarian assistance was needed in the Region, and underlined his relief to see that the support by the European Union which has been provided so far has reached those in need. Kurz also visited the refugee camp Baharka in Erbil province, where he met with families, to assess their needs. Regarding the conditions in the camp, Kurz stated that the large influx of refugees and their humanitarian needs presented a great challenge, and that Austria had a moral obligation to support the Kurdistan Region and the refugees. His visit to the Kurdistan Region was concluded by a meeting with Bishop Warda in a church in Erbil’s predominantly Christian Ainkawa district and a hosted lunch with members of the Yezidi community, including the Crown Prince, Hazem Tahsin, as well as Ms. Vian Dakhil, member of the Iraqi parliament.